Let me introduce the Pocketstation. Released only in Japan, it's a memory card with a screen where you can put little games that plays on a 32x32 monochrome screen. It's a quite fun and cute little hardware ! 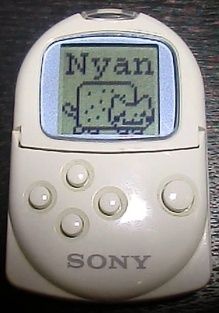 This was made from the well known "Neko95" which was a little program of a cute cat following the mouse cursor of your computer. It is now on your PocketStation so you can bring it with you anywhere ! This is a little Shoot'em up game I made for the Pocketstation with the help of a Nhut for the graphics. This game use the MikoTools(tm) Pocket Library by Miko.Hoshina. The zip archive contain the Game Rom, as well as a Playstation Tool that can be burn on a CD, allowing you to upload the game from your Playstation to your PocketStation. This tool allows you to manage your saves directly on your PocketStation ! You can view the save infos, delete a save, and also restore a save from delete !! This little tool runs on your PocketStation and allow you to read some BIOS infos, the serial number, do a BIOS checksum, and even Dump your BIOS ! This little tool helps you with various PocketStation dev stuff. 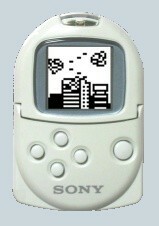 -Dump graphics from a PocketStation game rom. -Extract bin file usable on a PocketStation emulator from a memory card gme file. 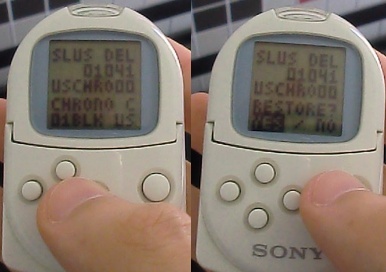 -Convert ASCII text to JIS text for your PocketStation rom. -Convert a 1bit BMP file to assembler data for your PocketStation rom.